Hong Kong Island is the southern, dense part of the Hong Kong Special Administrative Region. 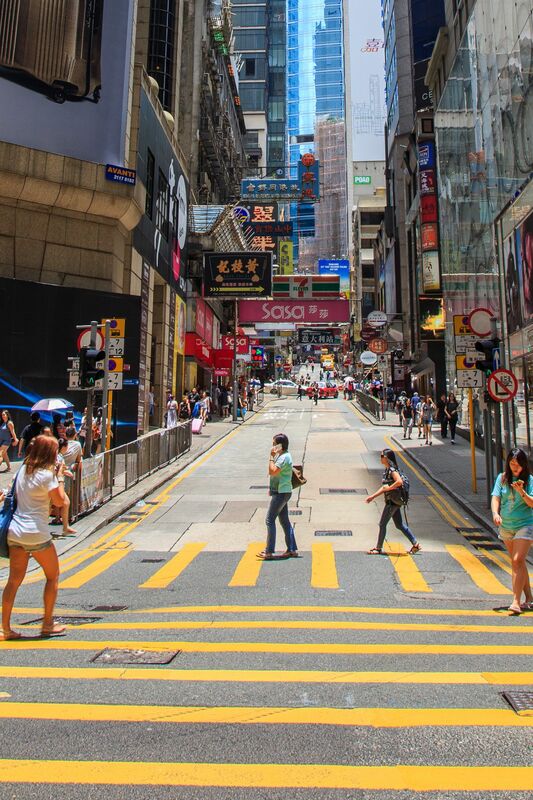 It contains Central which is the historical, political, and economic centre of Hong Kong. 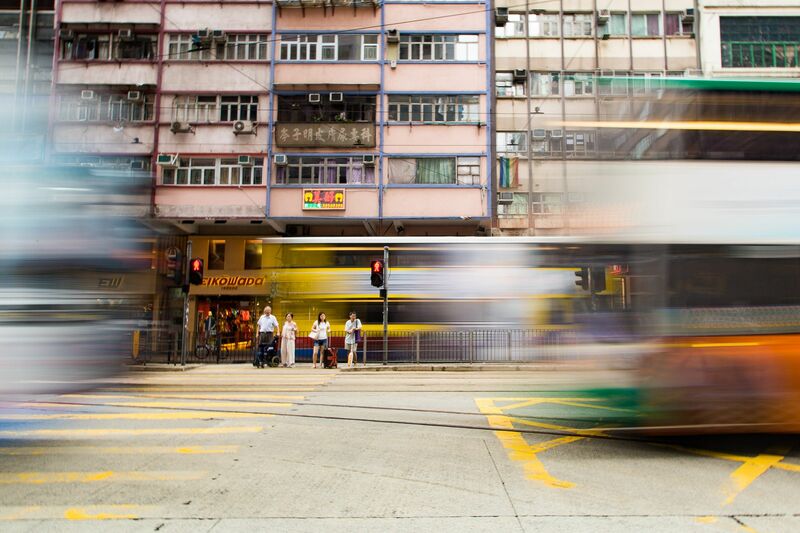 It also contains Causeway Bay, known for its shopping options, and Kennedy Town which is primarily known for the terminus for the tram. It’s rush hour! Thousands of workers are heading home in their cars or by transit. The pedway above the street leads directly into a metro station. 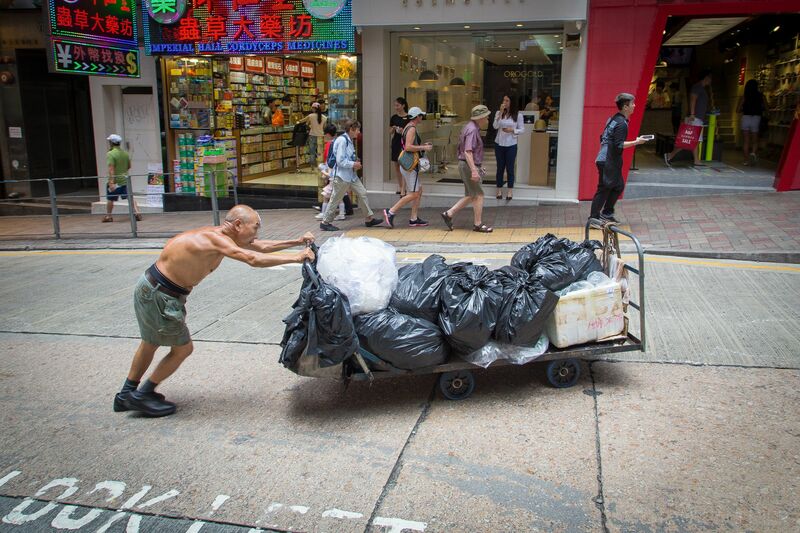 Hong Kong is a mix of old and new. A major construction project is underway as shown here on the waterfront next to the Convention Centre. 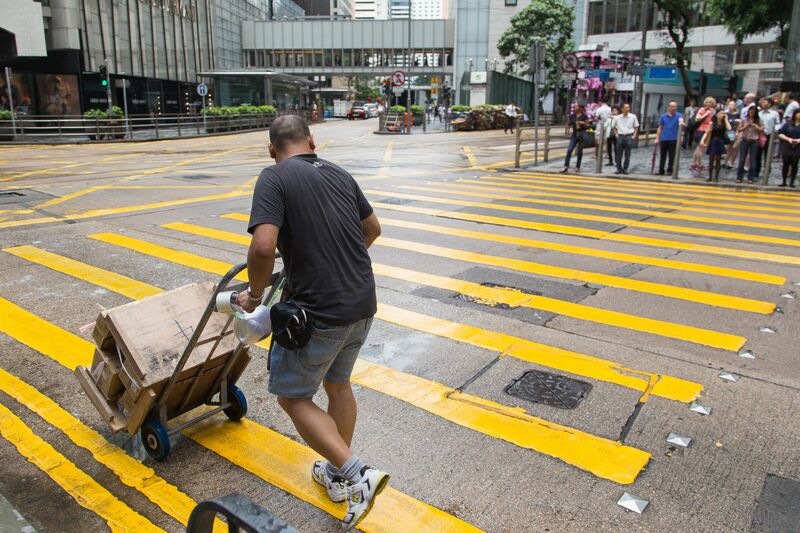 It was new for me to see so many people on the streets of Hong Kong moving boxes or bags on foot. 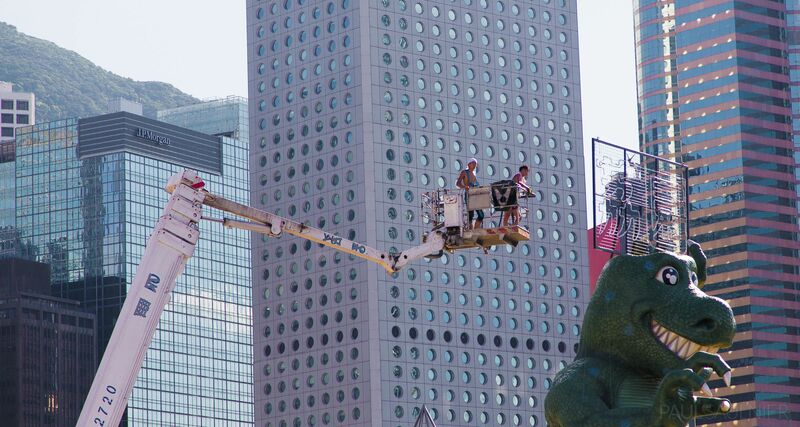 Work is being done to a big dinosaur on the waterfront. Even though this guys are high up, even taller buildings loom in the background. 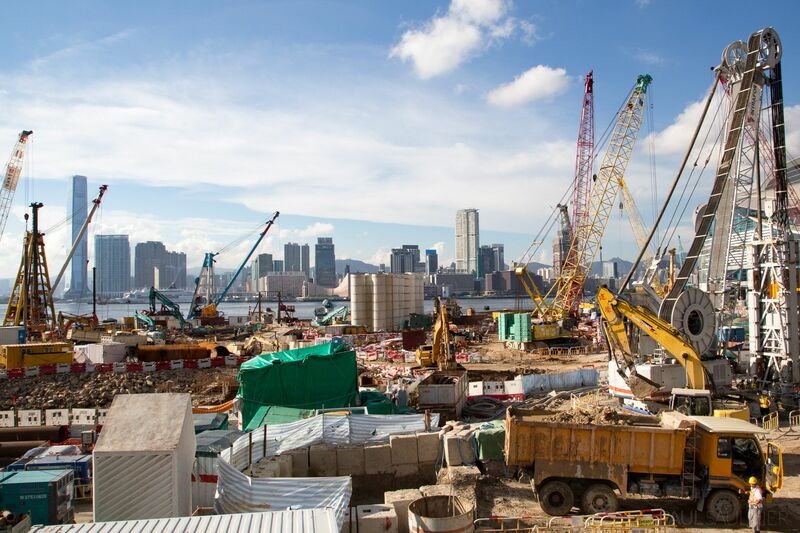 Hong Kong has largely developed in an upward direction. The name of this business amuses me. It sounds like they are saying you’ll get fat if you eat their food! 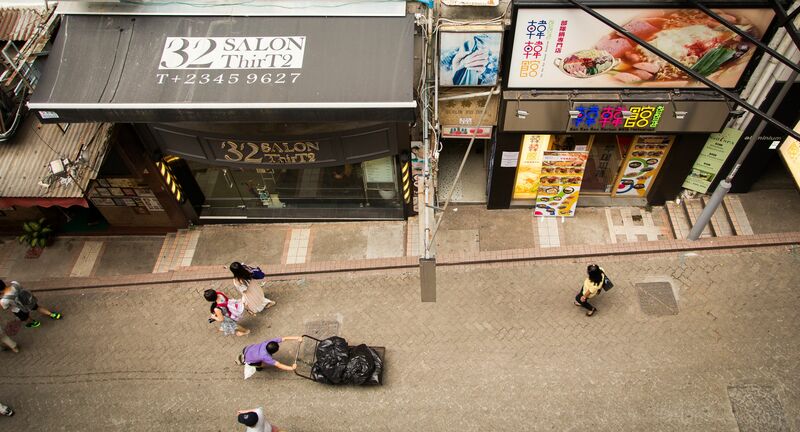 From the Central Escalator, you can look over the streets below. 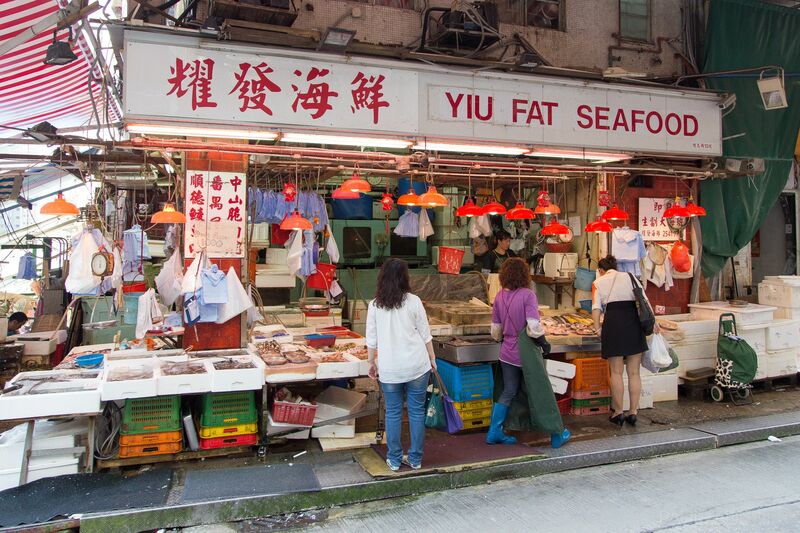 The Yui Fat Seafood business is near the centre. 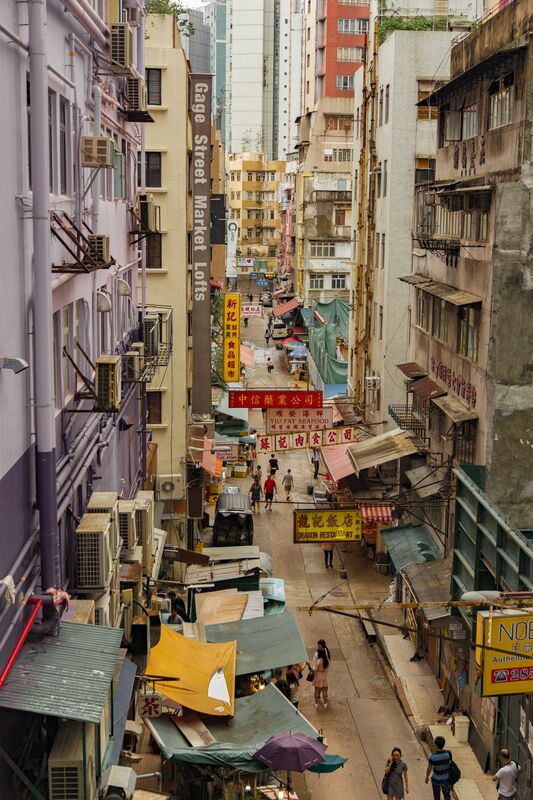 This is another view of a street below the Central Escalator. This is quite a steep hill, making it perhaps a little difficult to push such a large trolley. It amazes me still how some areas cram so many signs into a small area above the street. 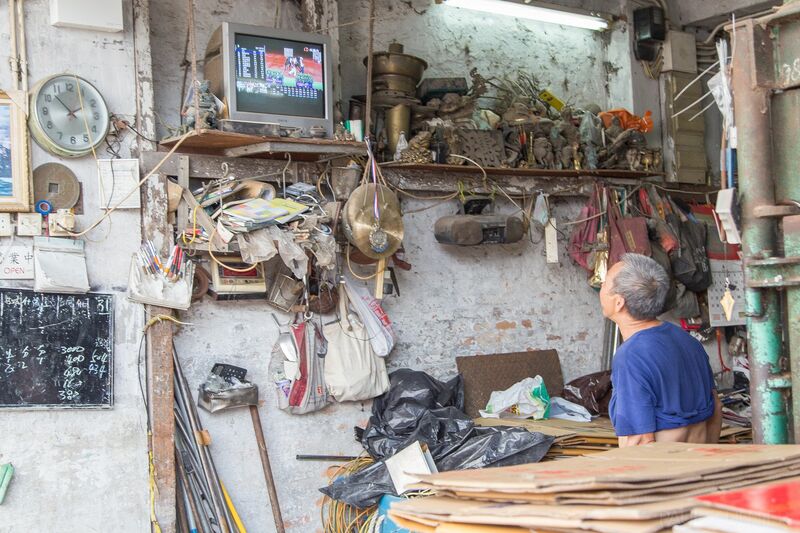 This business owner in Kennedy Town seems to be catching sports results on TV. This is a hardware store, although it seems a bit disorganized. I wonder what kind of circumstances led the store owner to operate this way, and how the customers feel about it. 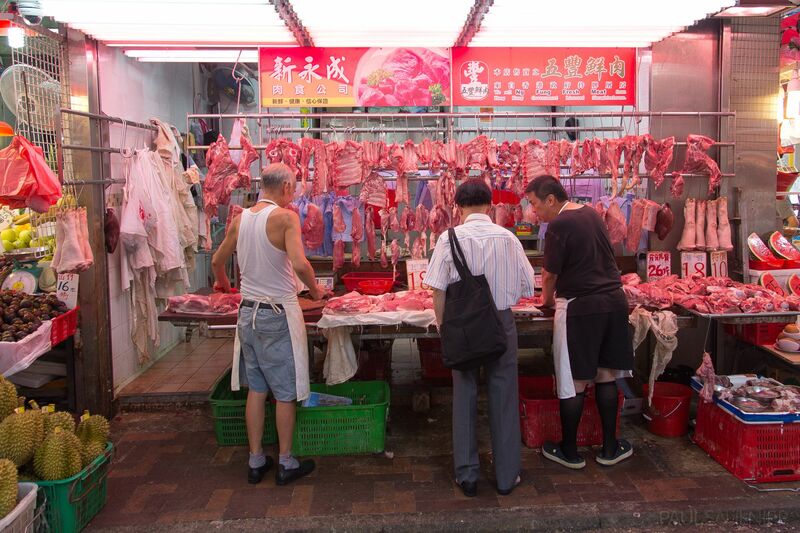 Fresh meat vendors can be found selling to the streets in several areas of Hong Kong. This is a practice that has generally disappeared in North America. 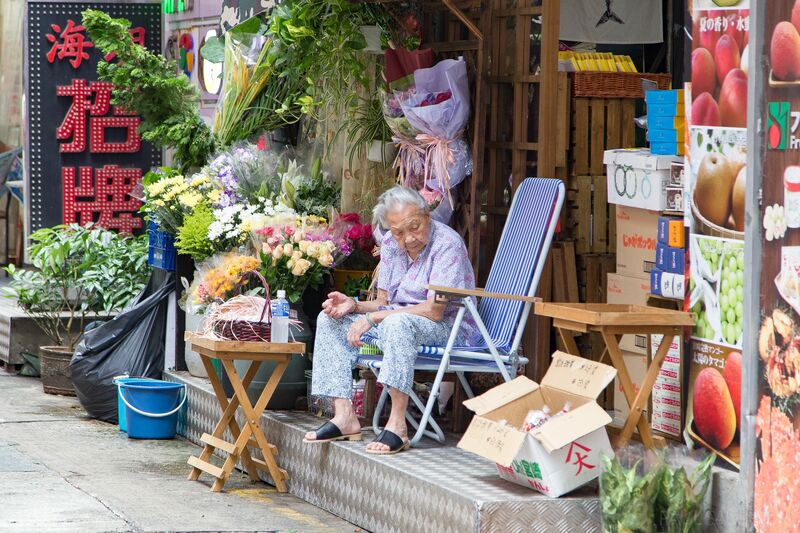 A woman sits outside a business, which I assume she operates, perhaps with her family. 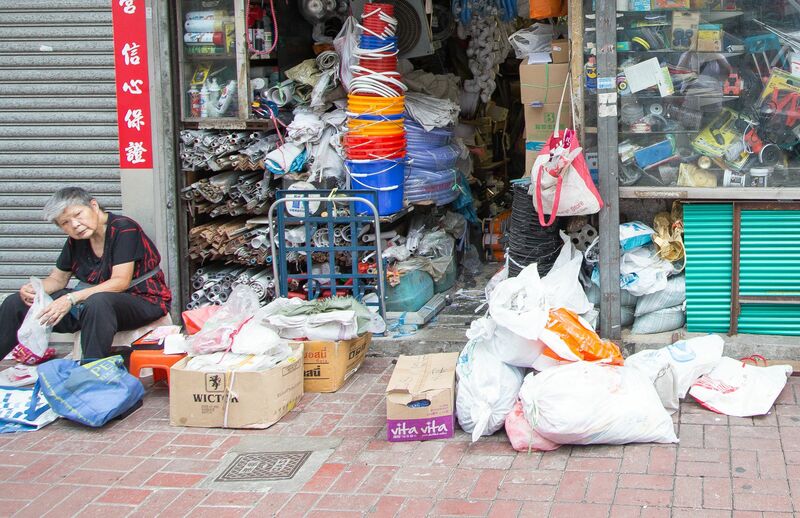 You can buy seemingly anything on the streets of Hong Kong. 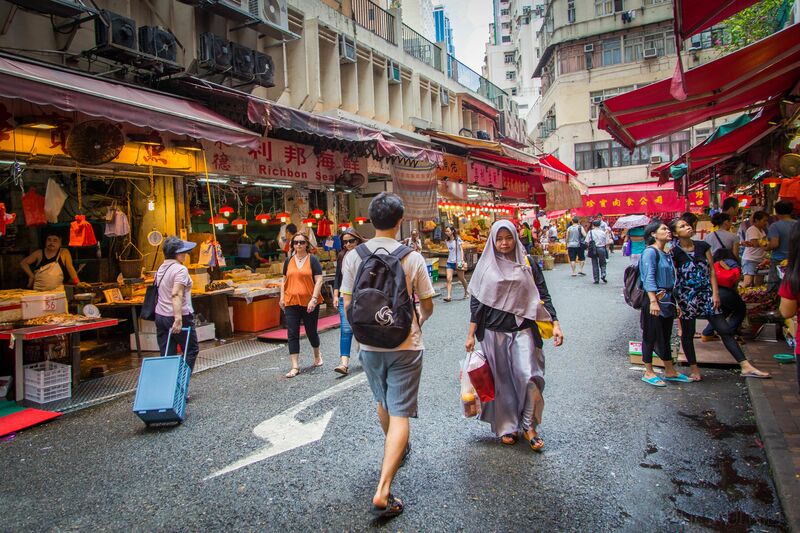 This market is between Causeway Bay and Central. 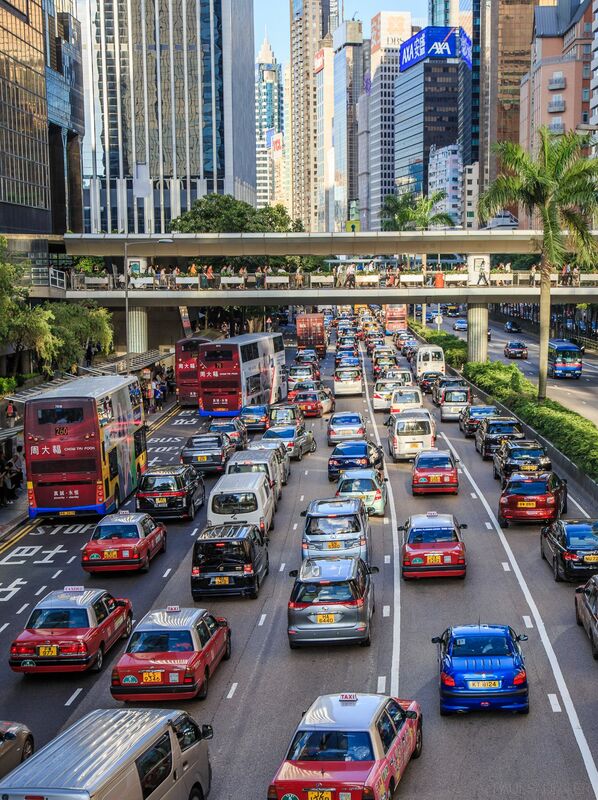 Traffic and commuters move below dozens of apartments in this dense urban environment.